Roasted asparagus served over noodles in a rich creamy chicken stock gravy. I'm seeing asparagus all over the store now, tender thin sticks of what my spouse and I refer to as 'spargel' since we fell in love in Germany [do not picture us getting all Lady and the Tramp with asparagus, because that would be silly and untrue]. I will undoubtably buy some spargel soon, because it's nearly Spring and Spring makes me think of asparagus, even if I won't get any until our Community Supported Agriculture (CSA) farm share gets harvesting in May. Locally, the asparagus is no where near harvest time--shoot, my daffodil leaves just peeked above ground 2 days ago. This is not a vegetarian meal, but it is one without meat on the plate. If you're looking for a light but flavorful Spring supper, read on. 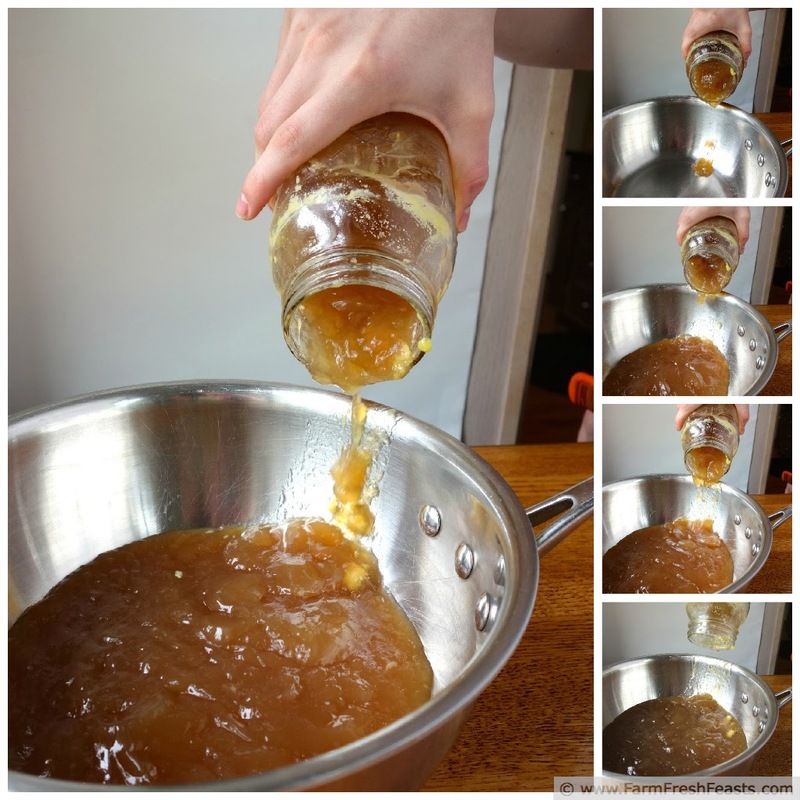 After I posted how I make chicken stock I learned from Meghan at Whole Natural Life to keep on cooking down my chicken stock until it was very concentrated, and when I do that I get jars of chicken jelly. This particular batch may have been extra concentrated due to excessive time spent surfing the internet (no, I was not on Pinterest). I'd safely say it simmered a good 4 hours. I was checking on it, but I just let it keep on going. The resulting stock, when chilled, is solid and spoonable. On my FB page, Karen suggests mixing this chicken jelly with flour and frying it in butter for a decadent treat. Sounds divine to me, and I appreciate the suggestion! If you have concentrated chicken stock and children, your kids will dub this Chicken Jelly and the name will stick. 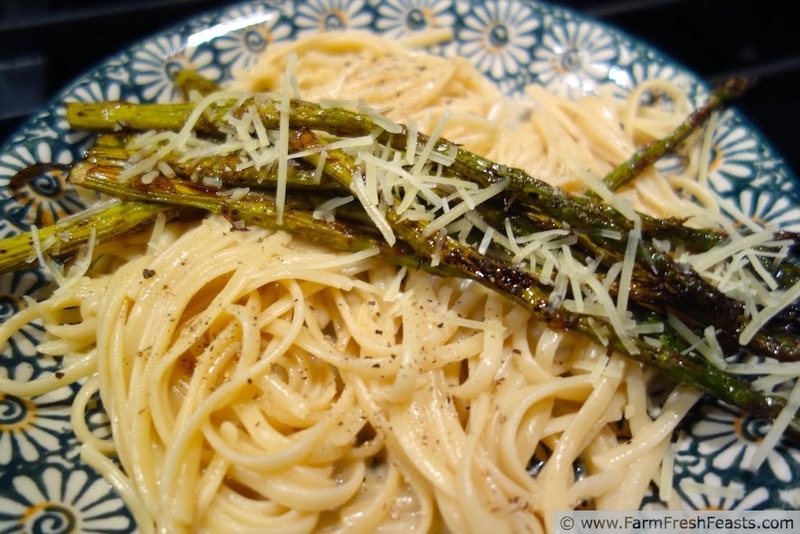 Then, when you want an easy weeknight meal, pick up some asparagus, head over to Alanna's to learn how to roast it, and start the pasta water. For more recipes using asparagus, please see my Asparagus Recipes Collection. It's part of the Visual Recipe Index by Ingredient, a resource for folks like me eating from the farm share, the farmer's market, the garden, the neighbor's garden, and great deals on ugly produce at the grocery store. Note: This involves making a sauce starting with a roux. My friend Sheri taught me that I need to let my butter and flour get nut brown, not just lightly tanned, for best flavor. So I do--while watching carefully so it doesn't burn. The stock can simmer for an extra hour, but a roux? Heck no. Constant vigilance! The sauce comes together pretty quick, so I was kinda roasting/boiling/sauce making simultaneously. This could almost be a Fast from the Farm Share dish, and I will load it under the Quick Take section of the Recipe Index by Category along the right side bar (---> if you're reading this on the website. If you're reading this via email . . . well just picture it). Roast asparagus in a rimmed baking sheet according to Alanna's directions. Cook spaghetti al dente, drain, and set aside. In a 3 quart saucepan over medium heat, melt butter over medium heat. Whisk in flour, and cook until it's a medium brown color, about 10 minutes for me. Whisk in chicken jelly and simmer until thickened, about 5 to 8 minutes. Stir in half and half and salt and pepper, then taste and see if you need to add any more seasonings. Toss the noodles in with the sauce. 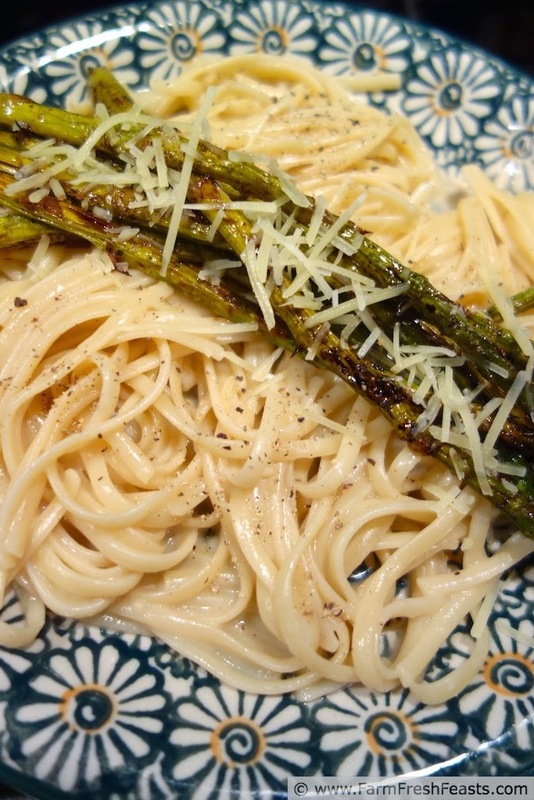 Serve with roasted asparagus on top, and add a scattering of Asiago cheese if you wish. I love the name! I often make stock reductions, but never thought to call them jelly. My kids--they're good for something, and will be pleased that you like the name they came up with. Yum! Creamy pasta, I would love to try this. It's quite tasty, and would work with a variety of vegetables. Thanks for stopping by! This sounds different, yet delicious!! There is nothing weird about an asparagus arsenal, in my opinion. And I can't resist in stores now either, especially since my daffodils are still under the snow! My dad is the Johnny Appleseed of daffodil bulbs, planting them wherever he goes, and his daffodils have just started peeking above ground. Finally! I read that name, god bless your sweet children, and... I don't know.... I guess I just wasn't picturing condensed chicken stock for the "chicken jelly" at first. Nothing wrong with condensed chicken stock of course, but the image first coming to my head - oh so many things wrong. Please don't tell me you were picturing some sort of chicken head cheese . . . that would be suboptimal in my opinion, though I'd try a taste if anyone presented me with some.